232. RUBIES and the RUBY RUSH. "But found they were not rubies. They were garnets". This is one of the very few consistent aspects of Lasseter's account of his alleged journey across Australia in 1897. In its various tellings and recollections Lasseter had heard of a discovery of rubies in Central Australia and a rush was on for the valuable gems. In 1897 at the age of seventeen years, Lasseter thought he would try his luck and like all before him ten years earlier had discovered, the rubies were common garnets. Lasseter pushed on west to discover that gold reef somewhere in Lasseter Country. In 1886 the explorer and surveyor David Lindsay, discovered brilliant red gemstones in the eastern MacDonnell Ranges. These stones were incorrectly identified as rubies and exaggerated by promoters and rouges as being the best ever seen. The following year, 1887, saw a modest rush to exploit the stones and hopefully drag South Australia out of economic depression. 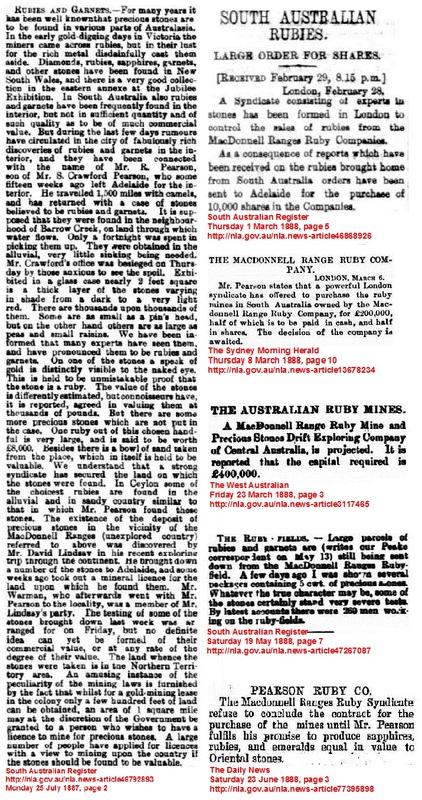 There was probably more activity on the Adelaide stock exchange and the mining pages of the press than on the ruby field, and within the year the unfortunate truth was known, the so called rubies were worthless. Ten years after this flash in the pan Lasseter arrived from the east on his single horse. Within the year ruby script collapsed and the promoters disappeared with the loot and the shareholders went broke. But the men in the field persevered and went on to discover the Arltunga and Winnecke gold fields that in turn lead to the founding of Alice Springs. well don't let them in the way of a good story. Cartwright Max Ayers Rock to the Petermanns 109. Coote E.H. Hell's Airport Chapter 33. Peter Donovan Alice Springs, Its History and the People Who Made It. Chapter 4.